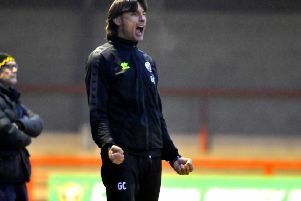 Gabriele Cioffi’s squad may well have been looking forward to Saturday off following their exit from the FA Cup but nobody would have been happy when their League Two match at Mansfield last Tuesday had to be postponed because of a waterlogged pitch. I guess the intrepid supporters who had undertaken the 370-mile round trip would have been among those least impressed by the referee’s decision. So with no football to watch it seemed appropriate to take a look at what has gone right or wrong in the manager’s first campaign. Many supporters are puzzled by the difference in Reds’ results home and away and I am one of them. Much is made of the fortress Broadfield tag but our home ground often lacks atmosphere while the noisiest fans are the regulars who travel to away games. It is not atmosphere and it is certainly not tactics, so it must be down to personnel. The January transfer window approaches and the squad could be strengthened. Firstly we need another striker. Ollie Palmer has been a revelation but Dominic Poleon has looked like a square peg in a round hole. We need cover for Palmer but ideally I would like to see someone playing alongside him. What’s wrong with two upfront? Playing two wingers and calling it an attacking three is not the same. Panutche Camara looked as though he could play off the striker but ironically seems to have found his niche as a playmaker in the middle of the park. I have long touted Josh Payne for that task, rather than protecting the backline so maybe, given his eye for goal and fearsome shot, he should play further forward. We lack proven talent in the middle although there is strength on the flanks. Several times recently shortcomings in the engine room have been factors in some embarrassing reverses. It’s not work-rate, even without Jimmy Smith, it’s a shortfall of quality especially in passing and movement. That surely can be improved by the coaches. The evergreen Dannie Bulman can cover the back four and sadly they have shown that they need some help. None of our defenders is enjoying a happy season largely because there is no consistency in their performances. Joe McNerney has been the most reliable of late but we have been undone by a lack of awareness and a failure to mark opponents closely. The club is lucky to be able to choose from four regular full-backs but at the moment none of them, defensively at least, is playing up to par. That is evidenced by the fact that Glenn Morris (arguably the best keeper in the division) has conceded a hatful of goals, despite pulling off a string of top- notch saves. He has been left exposed too many times and if Crawley do go shopping in January the priority must be to stiffen up the defence.